« Nature Must Be Stopped! This entry was posted on July 19, 2008 at 1:45 am	and is filed under climate change, health, politics, pollution, soil erosion, topsoil, Tourism, Travel, war. Tagged: cyprus, drought, ecosystems collapse, Mediterranean, water rationing. You can follow any responses to this entry through the RSS 2.0 feed. You can leave a response, or trackback from your own site. Looks like you borrowed from the CIA factbook for your demographic stats? Got someone looking hard at Spain? Also the GEAB basically says that the US will collapse over the course of the next year. It isn’t alone in this assessment. Looks like Chicago is already implementing martial law due to street gang warfare. The DJIA is in a head and shoulders holding pattern, and some folks are saying the crash could come as early as late August or as late as October. Such an event could spark a chain reaction that could bring down Chicago; the refugees from which would in turn overwhelm wherever they went. Question: You already consider places like Mogadishu and Somalia in general as having already failed/collapsed, right? No electricity, running water, sewage, law enforcement, tribalism, etc. etc. Now we have to also keep an eye on China, whose currency and economy was “structured” to provide the West with cheap goods, and who has now overheated and been subject to a devastating quake. The US economy is built around cheap Chinese goods; without them, many companies here will disappear overnight, and the blowback to the already flagging Chinese economy shouldn’t be trivialized. Hmmmm. 2012 might be conservative. I say look for the first wave to begin late this year. The source of data is clearly cited. 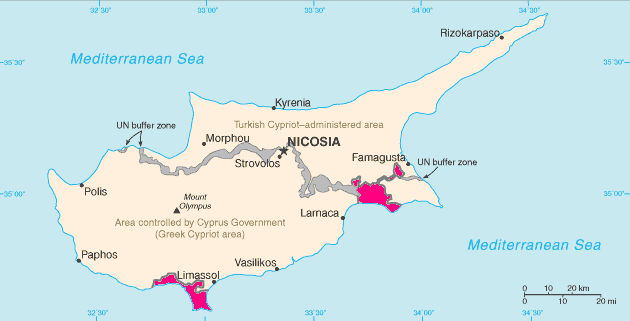 See section under Human Rights Issues and caption for Map of Cyprus. Most of the world’s demographic information including maps that are available via Wikipedia originate from the CIA World Factbook. And that isn’t a big secret. EDRO, FEWW, MSRB and RTSF (as well as Wikimedia, and others) would use non-govt. sources where available. Both GEAB and the DJIA are perfectly entitled to their opinions.